Goodbye tangles. Farewell fleas. Nix the too-long nails. Whatever your pet needs, our experienced groomers are there to meet their needs. We’re open seven days a week for your convenience. Call us today! 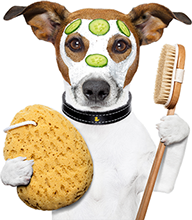 Whenever your pup come in for grooming, bathing, trims and more, we will always provide the personalized attention and loving care needed to put your pet at ease and make the process as stress-free as possible. If your pet feels most comfortable under your loving care, we offer the option of a do-it-yourself pet wash. Soothe your friend’s worries and bathe away the anxiety as the dirt goes down the drain in our clean, safe environment. We’re also here to assist, if you need a helping hand. Assistance if you need an extra pair of hands. Any questions? Use our contact form, or give us a call.